the technical aspects of their work. You may be prompted to install the free Adobe Connect "Add-In" to view. It's quick and easy. Enjoy the event and tell your friends! You'll see how Lauscha rods and tubes are hand pulled at the factory, and see how glass pens and a sculpted rooster are made. Hubert Greiner-Schwed creates a beautiful bowl using Lauscha striped tubing. Thomas Müller-Litz makes a complex montage vessel, and John Zinner shares his techniques for making a stunning sculpted red devil. Shane Fero and Fred Birkhill narrate a slideshow of the late Albrecht Greiner-Mai's work, and André Gutgesell shares his work with us as well. And as a grand finalé, you can watch footage of a movie from 1935 movie that illustrates the techniques and history of Lauscha. 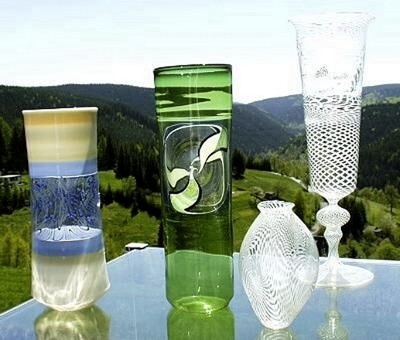 This webinar will give you an insider's understanding of the German flameworking style and how it has impacted glass around the world. Note: Audio levels vary between the various participants. Make friends with the audio slider at the bottom right hand corner of your screen in order to adjust loudness throughout the event. By the way, it's not really priced at one penny! I just couldn't get it in the shopping cart with a zero price. You don't need to add it to your cart, just click the link and there you go! It's a bit rough, but historic nonetheless!